Three years have gone by since St Michael’s Church in Ipswich was gutted by fire – leaving a charity’s dream of turning the derelict site into a community centre in tatters. JIMAS holds an open day at St Michael’s Church in Ipswich to discuss the future of the building after its restoration with members of the local community. 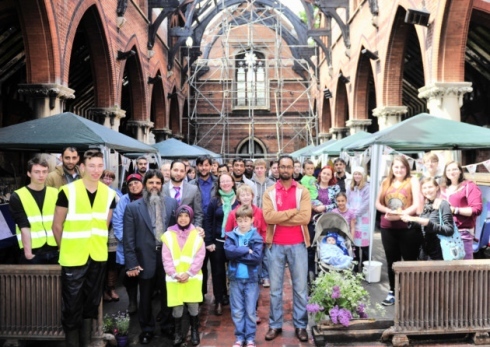 But last weekend people from all walks of life descended on the former church in Upper Orwell Street as officials from Islamic education charity, Jimas showcased the restoration work that has taken place. The day gave people an opportunity to see the progress being made on the building, but also to talk to those involved in the work and find out the future plans for the building. Manwar Ali, chief executive of Jimas, said: “It has been fantastic, mainly because a lot of people are coming who we haven’t seen before. “The awareness is still there. “This place has to be something of use to people in Ipswich so the more people who come the better. “I am quite happy, excited and encouraged and positive. The aim is to create a community space which can be used by people in the town and the first phase of getting the building usable will be work on the parish hall. If the charity gets the required funds then all the restoration work could be finished by the end of next year. Officials at the organisation are currently looking at ways to get additional funding for the project, which includes grants and other schemes. Paulin Goonan, project manager, said: “You can feel the atmosphere of what it is going to be like. “Kids are playing and it is very family orientated, which is very important. It’s really nice – it is a good atmosphere.